The Amish community lying north and west of Bloomfield, Iowa is one of the three largest in the state. Like the nearby settlement at Kalona, and the more conservative group found in Buchanan County in the northeast part of the state, Bloomfield is home to roughly 8 church districts, comprising about 175 households. Yet the Bloomfield settlement is by far the youngest of the three, having been founded in 1971, while the Kalona group came into being a full 125 years earlier, in 1846. Amish settlements develop and grow at different rates depending on numerous factors. 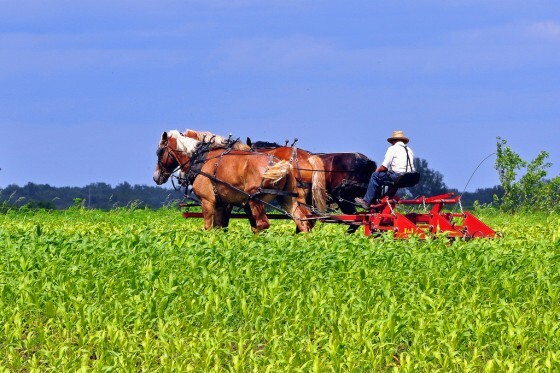 Agriculture remains important in the area, as seen in the above photo (photo credit: TumblingRun) of a Bloomfield Amish farmer working his fields with a three-horse team. The Bloomfield community is also quite entrepreneurial; as of 2003, there were at least 69 businesses in operation, roughly one per two households. These included three buggy shops, a strawberry farm/greenhouse, a bakery, a kiln, numerous furniture and wood processing businesses, a chimney seller, two horseshoers, a rug weaver, and a refrigerator business. I spent a few days in Bloomfield in 2004 while selling books in the settlement. It was a nice community, and my books did fairly well there. Bloomfield is also the home of Titus Wagler, an Amishman paralyzed in an accident in the early 1980s, and who was subsequently the subject of a book written by his father David. Titus runs a successful truss business in the heart of the community. Another business owner I recall meeting was a horse trainer. I didn’t get a chance to speak with him very long as he was in quite a hurry. Business seemed to be booming. But I found this quite a friendly group of people and I enjoyed the time I spent there, having some memorable conversations. Two discussions I recall were about travel and geography, with an Amishman quite interested in the topic and having a number of maps on his wall, and with another young father about the 9/11 attacks, as that day happened to be the anniversary of those events. As a related aside, Ira Wagler, who lived in the area for a period, has a few old photos of interest on his website. Ira also has an interesting post about running around in Bloomfield when it was a much smaller community. Read more on the Iowa Amish, including other Amish communities throughout the state, or view an Iowa Amish Furniture directory. As a Davis County since ’67, we have seen the Amish establish more businesses that we all can share, they are more socialble with the rest of us than when we first came to Bloomfield. We really enjoy knowing the Amish. We respect their ways and they respect ours. We often hire them to work for us and we patron their green houses, chain saw shops, grocery stores, lumber yards, etc. It is really great to have them in our community. I have had the same experience that Debbie S has had; I don’t live in Bloomfield, or even in Iowa … regardless, I have enjoyed my dealings with the Amish. I think their work ethic and moral groundings would make them an asset in most any community, though I do understand that they are not always welcomed with open arms when they move into a new area. The fact that they have three buggy shops makes me think that they are doing at least some work for outsiders, which is how I most frequently come in contact with the Amish. Eric, the term “team” usually describes two horses, one is a “single” and more than two is a “hitch” and I understand that in some areas they may be called a “span”, though I personally have only ever heard that term associated with oxen. Sorry about the double post. Not EXACTLY sure how that happened. I thought that I had not finished posting the first when I decided to modify. No worries Oldkat. And Debbie, thanks for sharing your experience. Oldkat, thanks for correcting me too. I can see I’ve exposed my non-ag roots yet again! Also, I think you could be right on the buggy shops–3 struck me as maybe one more than you’d expect for this size of a community. I am desparately seeking an Amish Draft Horse trainer to train my yearling Belgians to pull and drive in harness in single or team setting. I am looking for a trainer for my Norwegian Fjord horse to drive? I was wondering is there a spacific time of yr that the amish have Rum Springa? I have seen quite a few the amish since I have lived here in Iowa but , I never knew this was something that happened. I watch a documenty ( 1989) on the amish and the amount that leave the traditional way of life. I believe they said in the docu that 5 % of them leave the amish life style behind. I find them sometimes very intereting individuals. The amish in Bloomfield do not have rumspringa. I know this because i have grown up with the amish girls next door and ive asked them numerous questions and know a lot about the amish community. I grew up in Drakesville-Bloomfield Iowa, lived very simular to the amish in the early years, I have alot of respect for these hard working people, I woukld like to think that some of those good traits that I have, I owe to the amish life, that I was exposed to. In all those years I never met a mean or hateful amish person, obviously they are doing some thing right, I never felt any fear all those years. that any of amish community would ever harm me.I can’t say that now living in a big city such as Council bluffs-Omaha Nebr. How I wish I could be back there. Maybe some day when the good lord calls me home. Hi, I am a Chinese student in University of Nebraska-Lincoln. I am interested in the Amish culture. I am wondering if there is any tour or if we are free to go to this village for sightseeing?